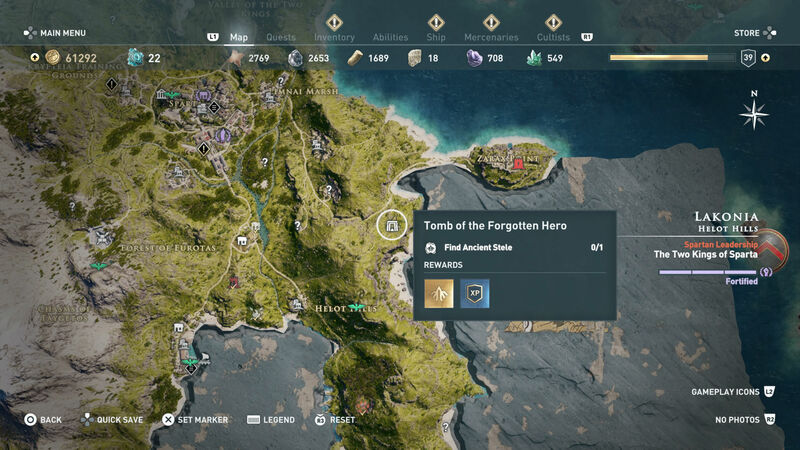 Where are all the Assassin’s Creed Odyssey Tomb locations? Ancient Greece hides many secrets. And, look, just because you’re not in Egypt any more, that doesn’t mean there aren’t plenty of tombs to uncover, too. Rewarding an ability point with each discovery, you’re going to want all of Assassin’s Creed Odyssey’s Ancient Stele locations to make sure your Kassandra or Alexios is in tip top shape. 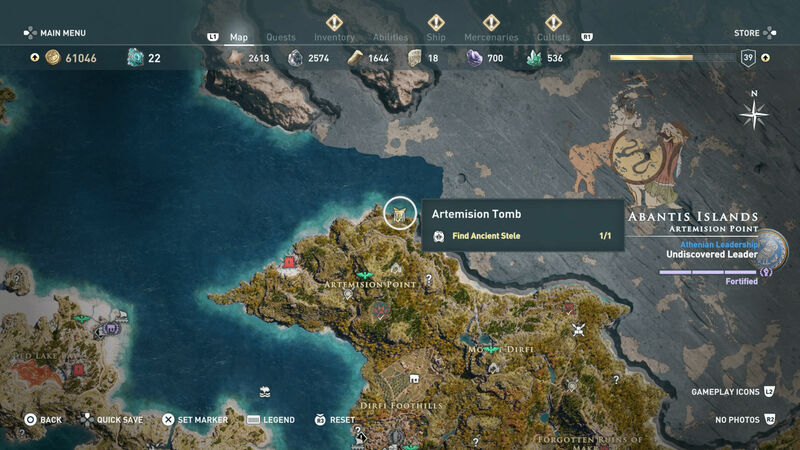 Below is our helpful list of each tomb, where you’ll find it, and where possible, a hint at the best place to fast-travel to, so you don’t have to ride half way across Greece. This isn’t a blow-by-blow guide as each of the Assassin’s Creed Odyssey Tomb locations is a variation on a theme of snakes, spikes, moving boxes, chests, and, of course, the glowing Ancient Stele itself. You can’t miss these as they glow gold with Ancient Civilisation writing. 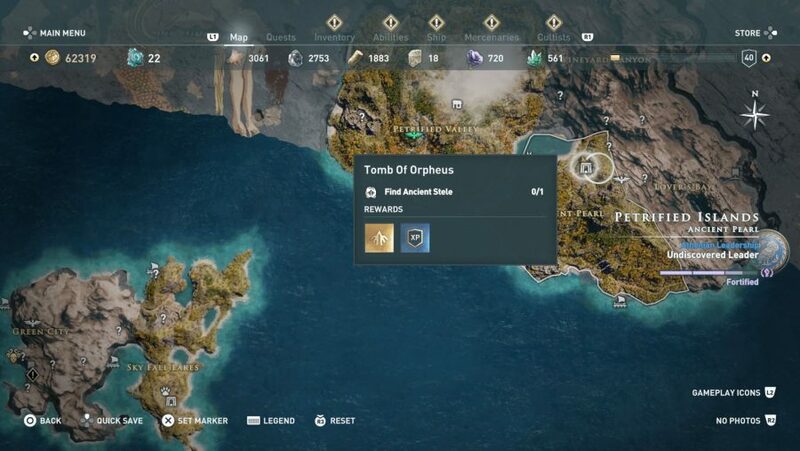 If there’s anything particularly tricky in the tombs we’ve flagged it below, but you’ll be fine, Misthios. Here are a few rules of thumb to get you started. Oh, and remember to equip your torch by holding down the weapon button. You can’t be fumbling around in the dark. Mind the spikes and the snakes. Look for smashable walls and listen for their telltale whistling wind sound. Light the torches as you go to show where you have been. Always explore everywhere for more gear. Look for an easy way out with a moveable box (or six). 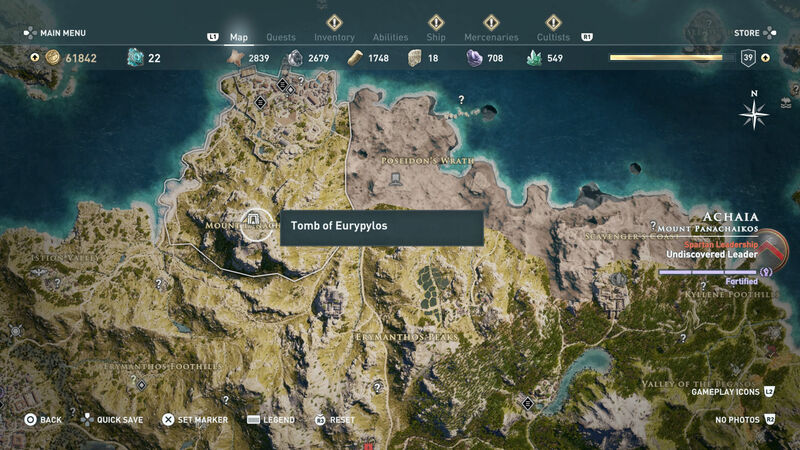 You won’t be starting off with the Tomb of Eurypylos as it’s in one of the higher levels of the map, Achaia, but we’re slaves to the alphabet here. You’ll find this tomb at the pinnacle of Mount Panachaikos, south of the town of Patrai. That’s the closest fast-travel point, so head there and ride up the mountain. There’s nothing difficult once you head inside. Journey down through smashed walls and destroyed pots and you’ll easily find the Stele. For Agamemnon’s Tomb you want to head to, funnily enough, the Palace of Agamemnon in the northernmost tip of Argolis. It’s either a ride north-west from the Temple of Poseidon in Argos, or a ride north from the Heraion of Argos in Hera’s Watch – if you have synched there. 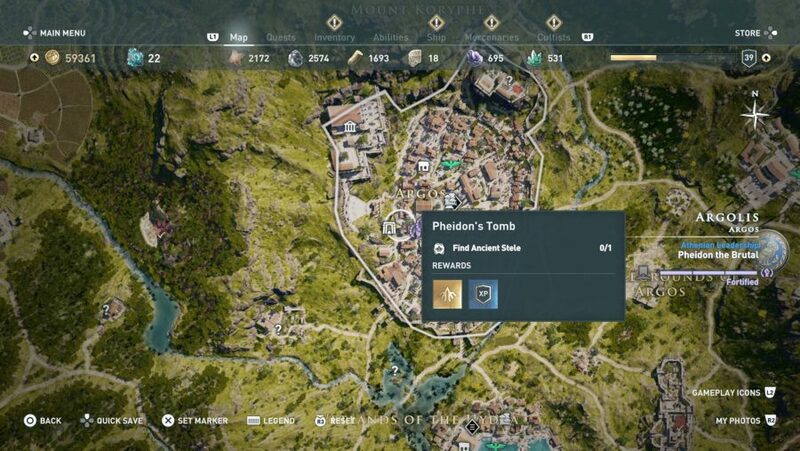 You’ll find Pheidon’s Tomb in the town of Argos in Argolis. 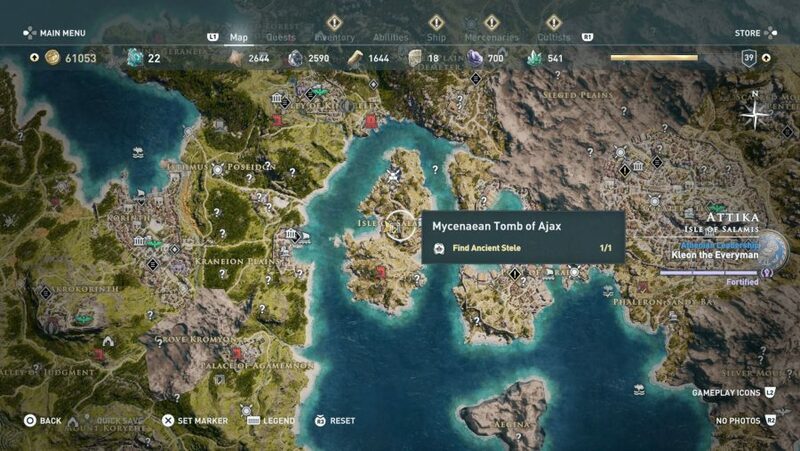 The good news is that it isn’t even far from the Temple of Poseidon, which you’ve probably already synched with, so just fast-travel to there, if you can. From there, head south-west to the question mark. You’ll find the tomb directly to the west of the Leader House. The entrance isn’t even hidden. Mind the double set of spikes when you get inside and slide under the gap to the left to nab some epic gear from a chest. There’s a stack of spikes and snakes on the way to the Ancient Stele so keep your wits about you. The first of two tombs in Arkadia is the Tomb of the Daughter of the Atlas. It’s on the west side of Mount Psophis. 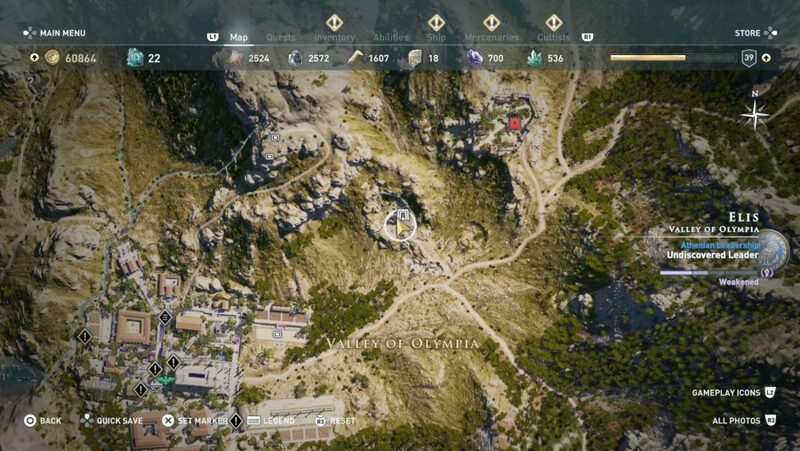 For a close fast-travel point head to the Temple of Zeus in the Valley of Arkadia and then ride south. There’s nothing complex here. Head inside, go down some stairs, slide under a gap, head into a bigger room, and you’ll find the Ancient Stele. An exceptionally easy skill point. Nab the chest on the right of the room – minding the snakes, of course – and head back out into the sunshine. 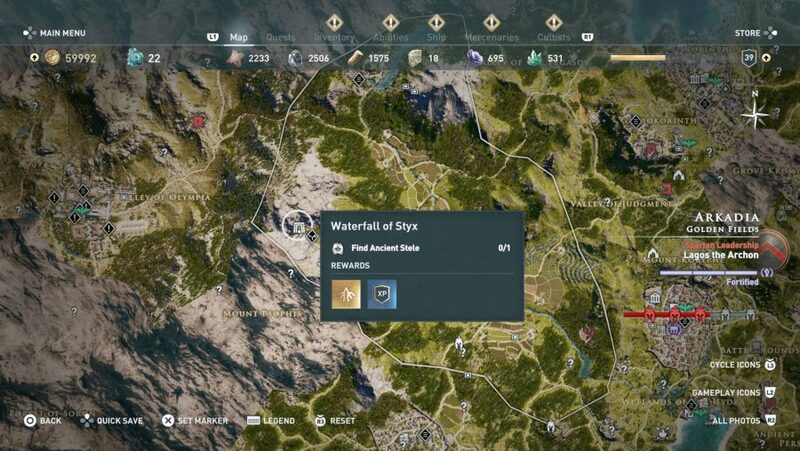 Head to the most northern region of Arkadia for the Waterfall of Styx. It’s in the mountains to the west of the Golden fields, just north of Mount Psophis. There’s a fast-travel point not far south of it. There’s nothing too complex here but, once you’re in, don’t get distracted by the first movable box when you pass it on the right side after going down the stairs. Head past it to get to the Stele along the passageway and around the corner. If you want to get a high-level gear chest too, then go back, move the box, and head into a maze of snakes and spikes to snag more loot. 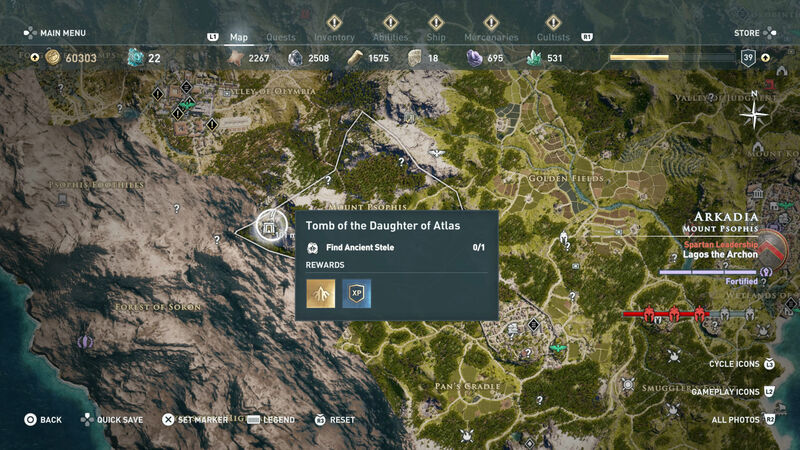 Attika’s lone Ancient Stele is in the Sacred Plain of Demeter. Ride north-east from the fast-travel point on the Temple of Apollo in Megaris. Get rid of the wolves guarding the entrance and quest inside. To get to the Stele, you’ll want to move a series of boxes to pull a final one away from a wall to reveal a gap you can slide through. 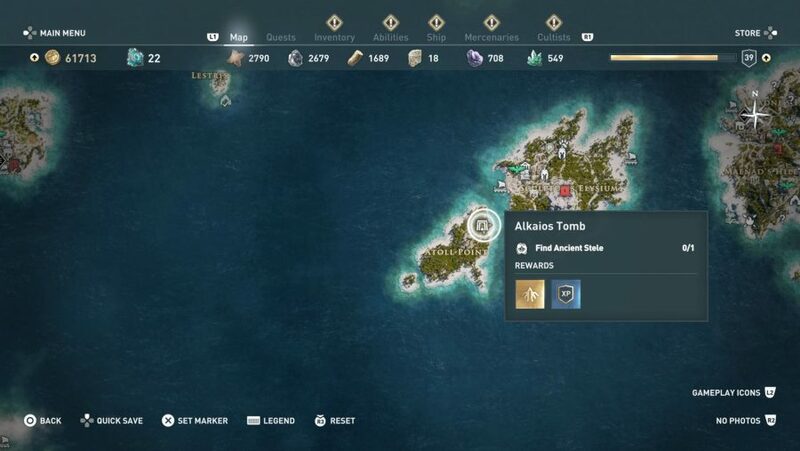 Head through and you’ll find your ability point and a chest in the same room. Move a box to exit and smash your way into the sunlight. Just be ready for the two wolves who are there to welcome you back to open air. For this Ancient Stele, you’re going to want to head to Oropos Heights in the eastern region of Boeotia. For a close fast-travel point, Kadmeia in Thebes isn’t too far, and you can ride east from there. There’s the usual blend of walls to smash, snakes, and spikes here, but it’s very straightforward. The room with the Stele also has a chest. Also, check the room opposite before you leave and you’ll find another two loot chests as well as a healthy dose of slithering reptiles. Chios, another endgame location, is where the Stony Sepulchre is lurking. You’ll find this Stele on the west side of the Affluence Bay region in the middle of the island. 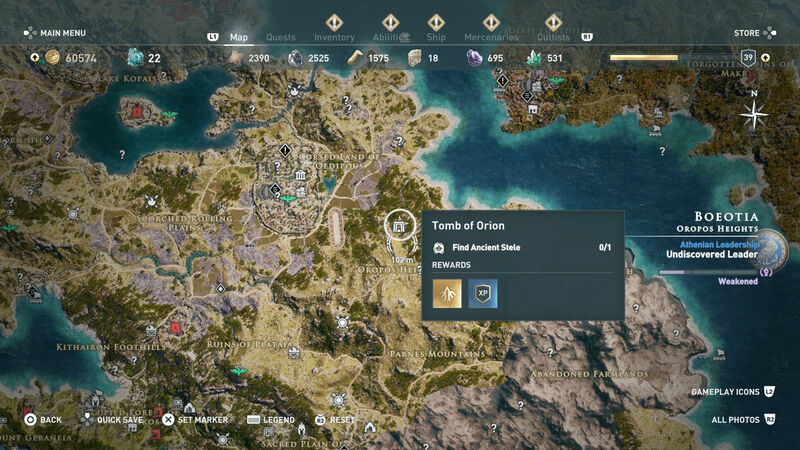 Helpfully, there’s a fast-travel point on Poseidon’s Temple if you’ve been here before, otherwise it’s a bit of a long sail to the east of the map. Head inside – don’t worry, the scorpions can’t hurt you – and you’ll quickly find the Stele after a small box moving puzzle. Spoiler: move them out of the way of the gap so you can get through it. You’ll also find a chest in the same room as the Ancient Stele (watch the spikes again). The route out is painless. 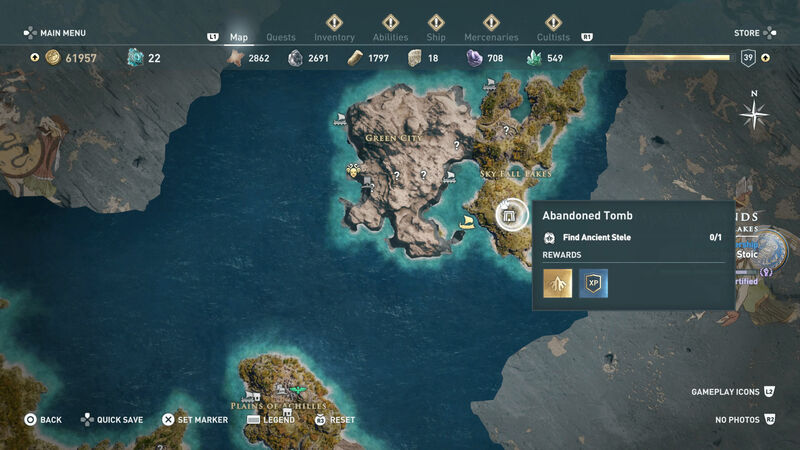 For this one you want to head to the Westworld-sounding island of Delos, west of Mykonos. The closest fast-travel point is the Archegesion of Delos in the north of the island. Once you head in, it’s business as usual but the Stele is unusually hidden away behind a smashable wall. Drop down through a hole in the floor of the big room you end up in, pick up the loot from a chest, and you’ll find a small room branching off with a snake in the middle. Bash the back wall and you’ll find the Stele. On your way out, slide under another wall and you’ll find a room of spikes with another chest at the back. Head to the Valley of Olympia for the Destroyed House of Oinomaos Ancient Stele. The house waits to the south-west of Fort Koroibos. 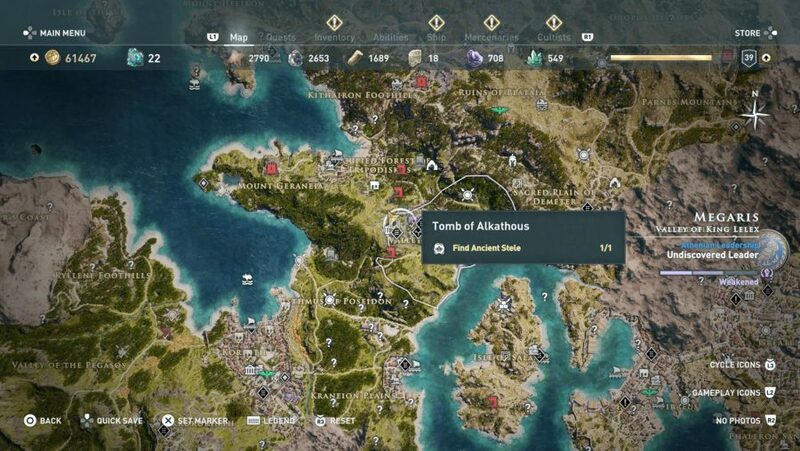 The best fast-travel point is the Temple of Zeus, which is relatively close. There’s no entrances inside the house itself – although there is a chest upstairs – so head around the back to the right to find the way into the tomb. You’ll be in and out of this one in no time. Just mind the spikes in the room with the Stele – and don’t forget to grab the chest on the right wall of the room before you head back out. You’ll find the Tomb of the First Champion in the north-eastern point of the Forgotten Swamps in Eris. Either ride from the previous tomb or, once again, fast-travel to the Temple of Zeus for speed. There are a few guards when you arrive but pick them off and you‘ll be free to head down what looks like a well and into the tomb. In a slight change from the usual order of things, you’ll need to move a box into position against a wall in the middle of a room to climb up to the next floor. Mind the snakes up there and continue until you find another room with a chest and more snakes. Slide through into a room that has an enormous spiked floor and then hit the weak-looking wall on the right with an arrow to save you becoming a kebab. Continue until you reach a corridor with another smashable wall on your right side. The Stele is hiddenly sneakily inside along with other loot. 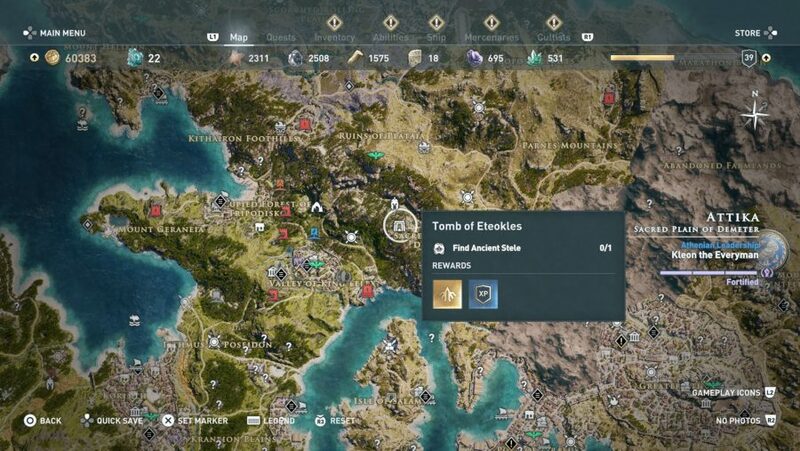 Hidden in the north of Artemision Point in Euboea is the Artemision Tomb. Your closest fast-travel point here is Istiaia Peak and then a ride almost directly north. You’ll find the tomb nestled in the cliff edge itself so you might get a bit wet trying to get to it. As you might expect, given its proximity to the sea, there’s an underwater section, but as usual follow the winding path and you’ll find the Stele in the same room as a chest. There’s a neat shortcut out, too, if you smash some pots with an overpowered arrow. The Isle of Salamis is a tiny island located in the bay between Megaris and Attika. 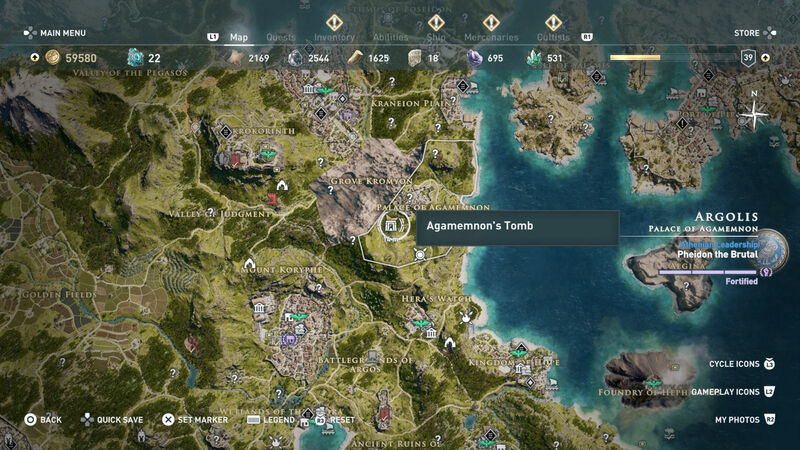 Unfortunately, there’s no fast-travel point on the island but it’s easy enough to take a tiny boat out from the Port of Piraeus if you fast-travel to the Temple of Asklepios. There will be a band of NPCs and perhaps the odd lion to kill before you get in there, but head inside, and it’s tomb business as usual. You’ll see the Stele through a broken door at the bottom of some stairs so it’s just a matter of finding a different way in. Via snakes and spikes of course. 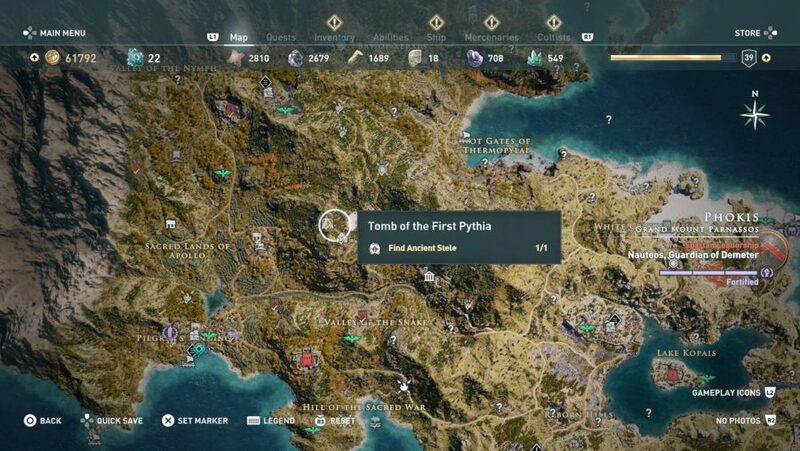 If you’ve already been to Kos, there’s a handy fast-travel point to the south of the Tomb of Polybotes. If you haven’t, you’ll want to sail south-east of Naxos to reach the island. The tomb itself is in the north of the island just on the beach on the eastern side. You’ll have to smash your way inside but you’ll find the Stele easily enough with some of the usual snake and spike avoidance. Plus, keep an eye out for a smashable wall to make a quick exit from a corridor of far too many reptiles for comfort. Lakonia’s Ancient Stele is in the north-east of the Helot Hills. You’ll want to ride north from the Helot lookout fast-travel point to get there as quickly as possible. Smash the first set of pots on the right side in the first room, slide through the gap in the wall, and you’ll reach the Stele post-haste. 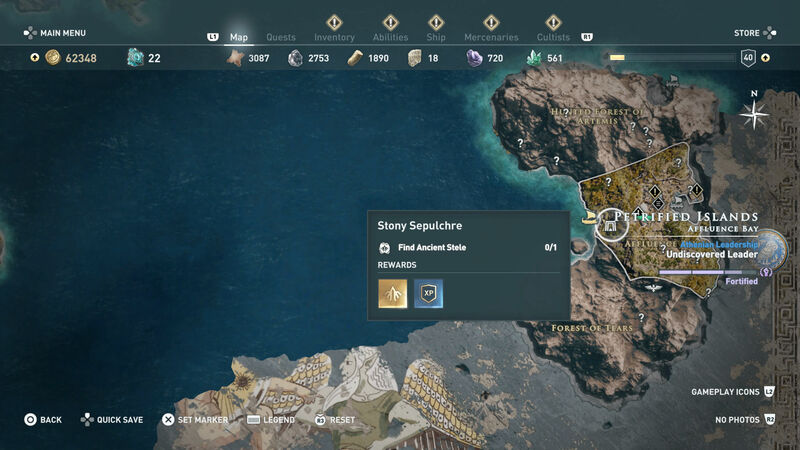 Keep an eye out for snakes as usual as you explore further and you’ll find a number of chests and plenty of Drachmae from scattered skeletons. Just don’t become one of them. You’ll find the Abandoned Tomb in the south-east corner of Lemmos, south of the Sky Fall Lakes. You’ll want to fast-travel to Green City before riding across the island and down to the tomb. 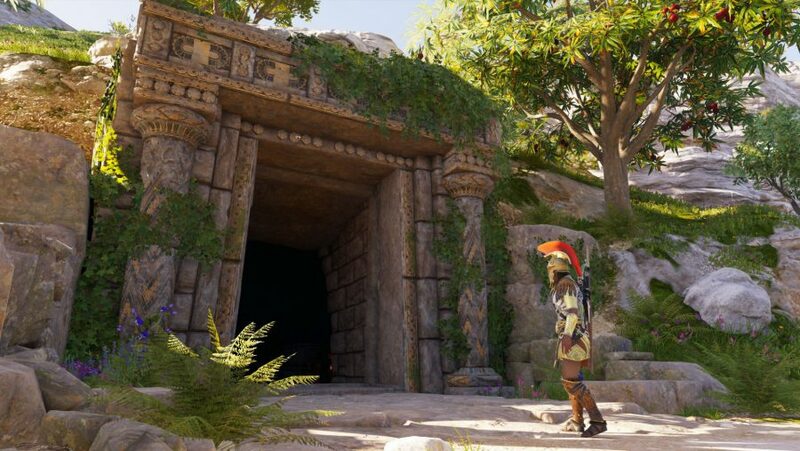 Once you’re inside, this tomb has a tricky circle puzzle of push and pull to perform before you can get to the Stele. Head along the corridor and down the stairs until you reach a box that can be pulled towards you. Yank it forward as far as it can go before heading back up the stairs and into a room with a hole in the floor. Drop down and slide through the gap that you made by dragging the box clear. You’ll find the Stele shortly after, guarded by a stack of snakes. Toast them and grab that ability point. This particular tomb is hiding on Lesbos in the northern section of the Ancient Pearl region of the island. Thankfully there’s a synch point directly to the east, but given the fact that this is an endgame location, chances are you’ll need to sail north-east of Lemnos in the Adrestia to uncover this location. Once inside, clamber up a level in the statue chamber to progress and keep watching out for boxes to move. You’ll end up in a room with no floor. Drop down, get rid of the snakes guarding the chest, and you’ll find the Stele on the reverse of the papyrus shelves. You’ll find the Tomb of Alkathous in the west of Megara in Megaris. The speediest fast-travel point is definitely the Temple of Apollo. From here you can just ride west to the entrance that’s dug into the hillside. There’s nothing too complex at work in here. Keep heading downwards and you’ll eventually get to the Stele at the end of a corridor. 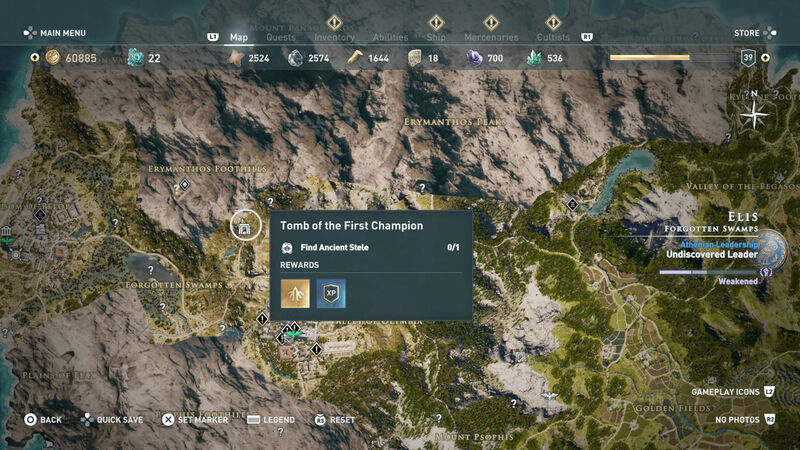 Turn left at the Stele once you’ve collected your ability point and you’ll get a shiny chest on your way back up to the surface. It’s time to head to Naxos for the Giant Heroes Burial Ground Stele. It’s lurking on the north-eastern quadrant of Naxos in Marble Bay so your closest fast-travel point is the Temple of Dionysos in the town of Naxos. Make your way there and then ride east to the tomb. Head into the darkness and you’ll have to dive into a pool of water but there isn’t too much breath holding to do. You’ll find a chest under there and you’ll enter into another chamber soon enough. 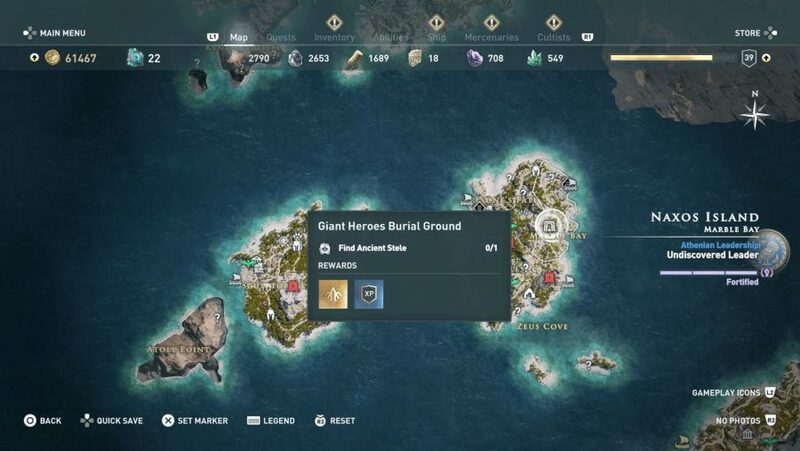 The Stele is in the very next one, along with a chest. Collect your loot and enter the way you came in. 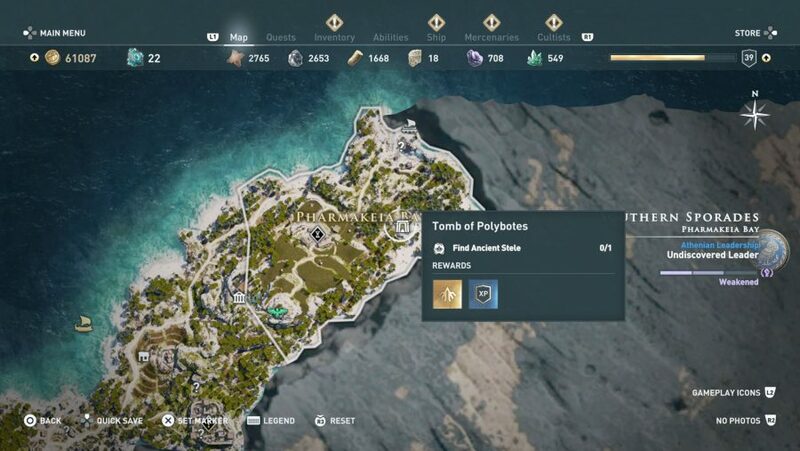 The Alkaios Tomb in Paros is located on the tiny Atoll Point to the south-west of the main island. 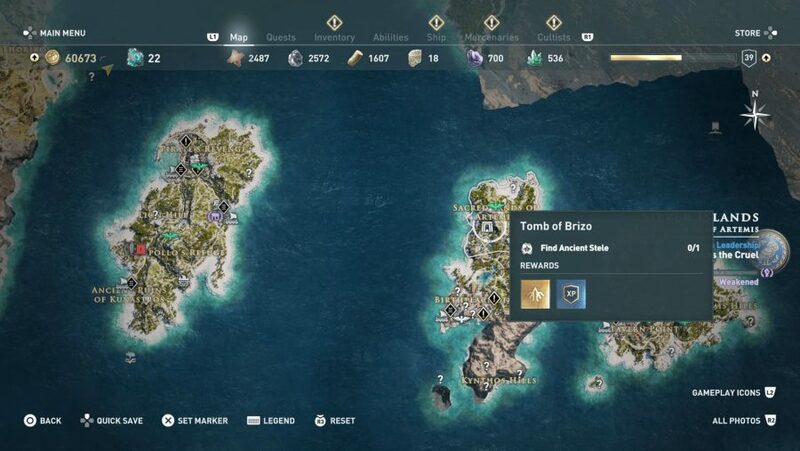 There’s no fast-travel point on there so you’ll have to zoom to Athena’s Watch in Paros Habour. Commandeer one of the small boats floating at the jetty and then sail over to Atoll Point. The entrance is cut into the cliffside but you’ll have to kill some enemies doing a ritual outside before you head in. This is a relatively easy tomb. Just keep an eye out for moveable boxes and you’ll find the Stele in a very spiky room, along with a chest. Break through a wall on your way back out for a second chest of loot. The Tomb of the First Pythia is located in the west side of Grand Mount Parnassos. Your closest fast-travel point is the Temple of Apollo in the Sanctuary of Delphi. Run west of here and you can’t miss the tomb surrounded by autumnal trees, complete with a statue outside. This is another easy one. Head inside, slide through a gap in the wall to the left before the main statue chamber, and look out for a breakable wall with a snake in front of it. You’ll find the Stele in here. Check the other side of the entrance corridor for a way to two more chests. 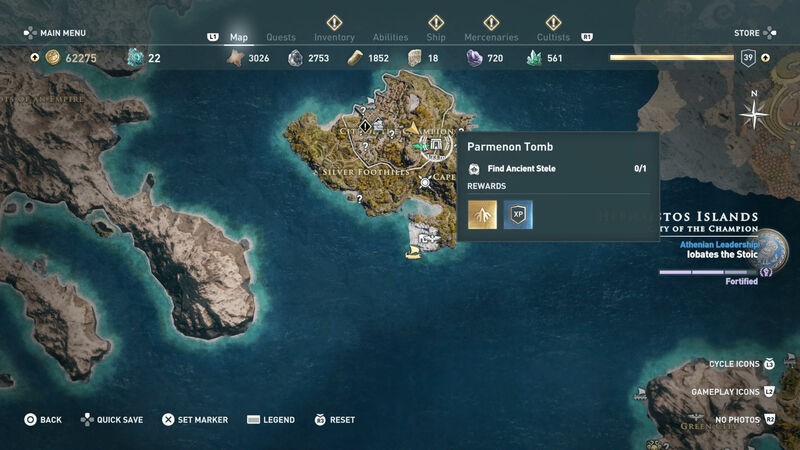 Head to the island of Thasos in the northern part of the map for the Parmenon Tomb. Thankfully, if you’ve been to Thasos, you’ll probably already have synchronised at the Thasos Temple, which is a veritable Assassin hop, skip, and jump from the entrance to the tomb. Otherwise, you’ll have to sail north-west from Lemnos. The final tomb on this list is one of the easiest. Smash some pots, follow the path, and you’ll quickly find the Stele and a chest of loot to match. As always, though, watch out for snakes. There are four in the final room who look particularly hungry. If you’ve done them in order, happy 22nd ability point!